We were planning to attend a Halloween event at our local zoo. My five-year-old daughter had decided to dress as Little Red Riding Hood and wear a red cape that was knit by her great-grandmother and worn by me when I was also five years old. My husband jokingly suggested that he could dress as the Big Bad Wolf and I could go as the Grandmother. That suggestion got the creative juices flowing and I realized I had two hours to pull something together if we wanted to have a Little Red Riding hood family costume theme. After a quick trip to Goodwill and Dollar General, I came home and dug through the craft bin before starting to work on the costumes. There wasn’t any extra work required for the Little Red Riding Hood costume. With the red cape, a shirt, skirt, some leggings, shoes, and a basket, we were set! I found the perfect Granny nightgown at Goodwill (my daughter is convinced I should wear it nightly). And I completed the outfit with some stockings and white hair spray from Dollar General as well as a cane borrowed from a neighbor. The Big Bad Wolf costume involved a little more work, but came together better than I had envisioned. I bought a brown, velour hoodie at Goodwill (don’t tell my husband he might be wearing a woman’s hoodie!). I googled ideas for Do-It-Yourself Big Bad Wolf costumes and found the perfect solution on a Martha Stewart website. Following her instructions, I used felt, paper, and hot glue to make eyes, nose, big teeth, and claws and hot-glued these to the brown hoodie. Since I didn’t have brown felt and wanted to make big, fuzzy ears, my daughter and I deconstructed a stuffed bear we had purchased at Goodwill. What a mess! I will probably be finding brown fuzz throughout my house for the next several months. My daughter commented that it was like performing surgery (she didn’t know the word for amputations) on a stuffed animal. However, it did result in the perfect, brown fuzzy ears to complete the Big Bad Wolf’s costume. We went to the zoo and got many compliments while trick-or-treating. 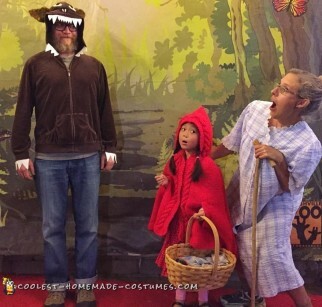 I think people enjoyed seeing a vintage idea like our Little Red Riding Hood family costume. Rveryone is familiar with that story from that childhood. While it was a lot of fun dressing up as a family for the first time, the most special part of the evening was watching my daughter wear a costume that was originally hand-made by my grandmother, who just so happens to be the only living grandmother still with us.